Specially designed skates for moving scenery, three pressed steel, zinc plated swivel castors fitted on a black fabricated frame with a separate top plate fixing and available with a choice of wheels. 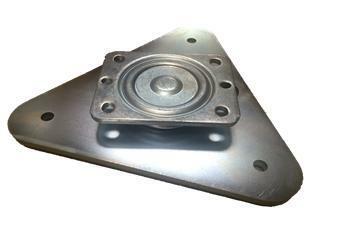 The central heavy duty swivel head, mounted on top of the triangular base plate, carries the load. It has a top plate with four bolt holes for securing the load and an access hole is provided in the base plate to enable mounting bolts to be fitted. Â Latest Web page is here.